I remember it as if it were yesterday. I was sleeping dreamily in the room I shared with my little sister back in our farmhouse in Michigan. Sis came into the room and shook me on the shoulder. "Hey get up. The Pope is dead." Well that was old news. "The Pope died weeks ago. Leave me alone." As I started to turn back to my slumbers, sis laughed and said, "It's the new Pope that died!" And that's how I found out that Pope John Paul I had passed a way, a mere 33 days into his pontificate. I remember being astonished at the news and wondering how all of the cardinals and people of Rome would feel about gathering again to pick a new pope after having just completing the process a mere month ago! So the world waited and watched - and my family was with them, glued to our t.v. set. I remember welcoming the excitement. My beloved grandmother had died in July of that year and we were trying to reformulate our family without her in it. When the announcement came then that a Polish man had been elected pope we were thrilled and it made us all the more joyful. There were things about the new pope that just seemed to make everyone love him. 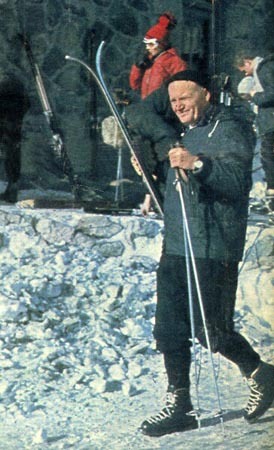 By choosing the name John Paul II, he honored his three predecessors - and I really respected that. He traveled- everywhere. 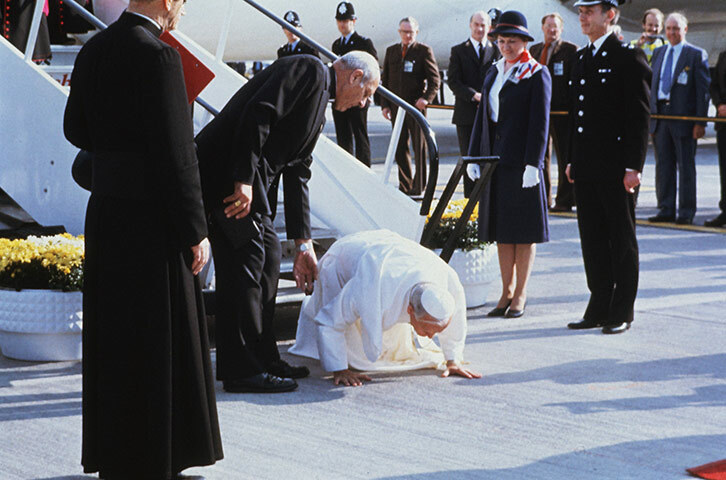 And he always took the time to kiss the ground wherever he landed. I always thought he was honoring the country he was visiting but now that I'm a bit older I wonder if he was also giving thanks for a safe arrival! Then there was the horrible day he was shot. By that time I was working in a doctor's office and I heard the news on the radio. 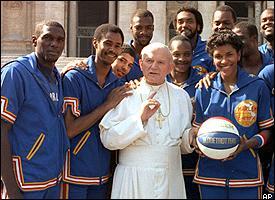 I remember the parishes around town praying for the life of our Pope. 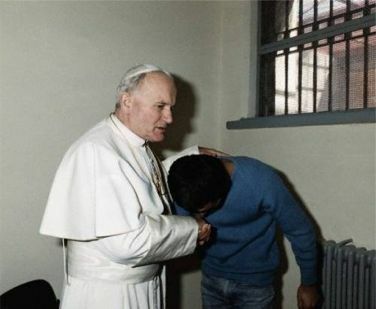 Then two years later, John Paul II showed us what it means to truly be a Christian, when he forgave his would-be assassin. 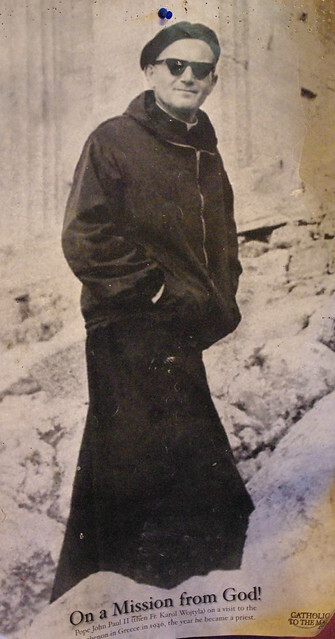 In some ways I feel as if I grew into adulthood with Pope John Paul. I left my childhood home, married Mr. Pete, moved to another state, suffered the deaths of my beloved grandfather and uncle, became a career woman for a time, before I left that behind to become a mother, and slowly but surely learned to reject the pablum that passed for Catholicism in my very liberal Catholic high school, and reverted back to my Catholic faith with enthusiasm and love. I watched him age just as my mother, mother-in-law, aunts and uncles aged and I saw the dignity of the spirit as well as the beauty of aging that gets overlooked in our youth-obsessed culture. 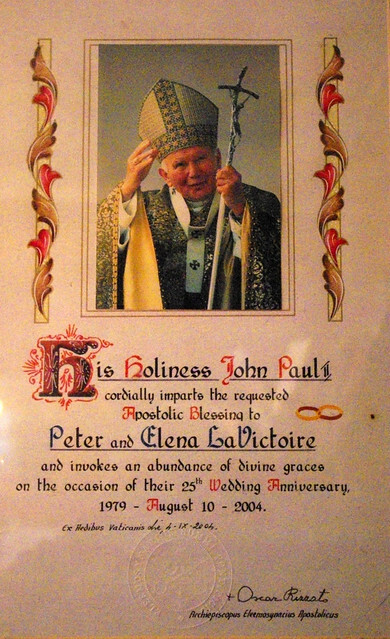 In my household, I have two pictures of John Paul II. This one I got for the kids - because I wanted them to consider that choosing a religious vocation really could be cool. And then this one to mark our 25th wedding anniversary - I will always cherish it. and ground ourself in the gospels.